For large, heavily soiled wash loads use 1 full cup of Super Washing Soda along with the usual amount of either liquid or powder detergent at the beginning of the wash cycle. (Always follow machine instructions when adding laundry products.) Add clothes and let washer fill completely. 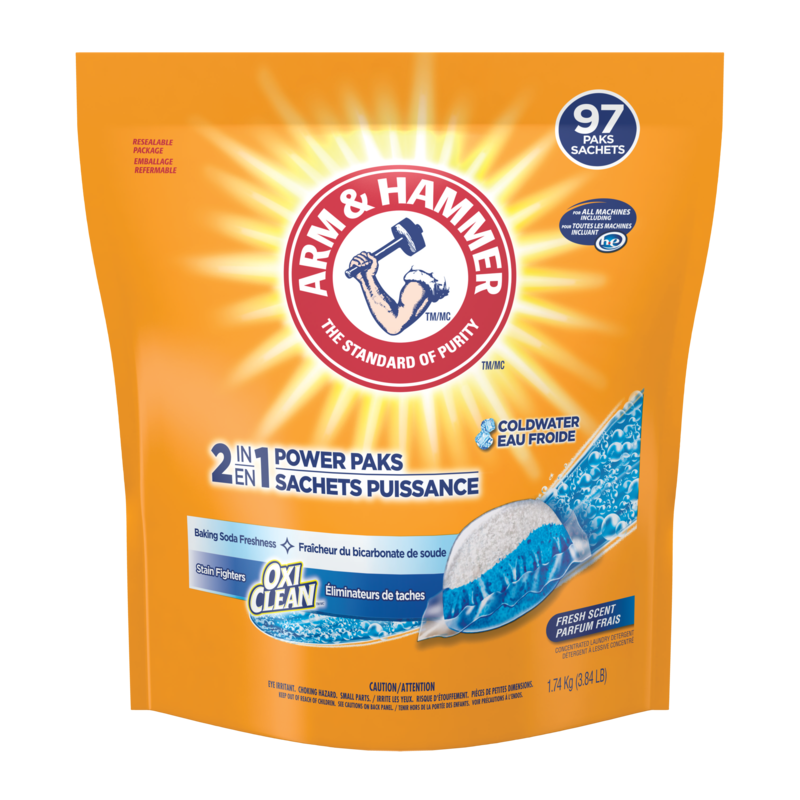 For hard water conditions, add 1 cup of Super Washing Soda along with the usual amount of either liquid or powder detergent at the beginning of the wash cycle. Super Washing Soda adds extra cleaning and freshening power to your detergent. Stains and greasy soils sometimes need special handling. Often a routine machine wash will just not be enough to remedy stubborn problems. The most effective way to remove stains is to begin treatment as soon as possible. 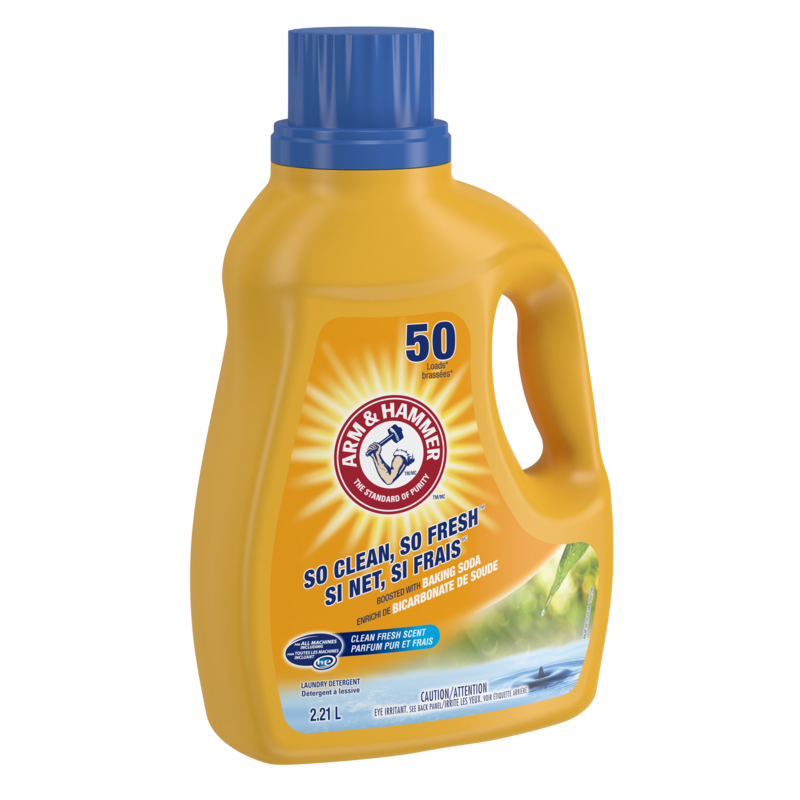 Although some stains may be impossible to remove, a pre-treatment or pre-soak with Super Washing Soda is often very helpful – especially for removing greasy stains and embedded dirt from synthetics and cottons. Make a paste of 4 tablespoons Super Washing Soda and ¼ cup warm water. Using rubber gloves, gently rub paste into dampened stain and wash as usual. 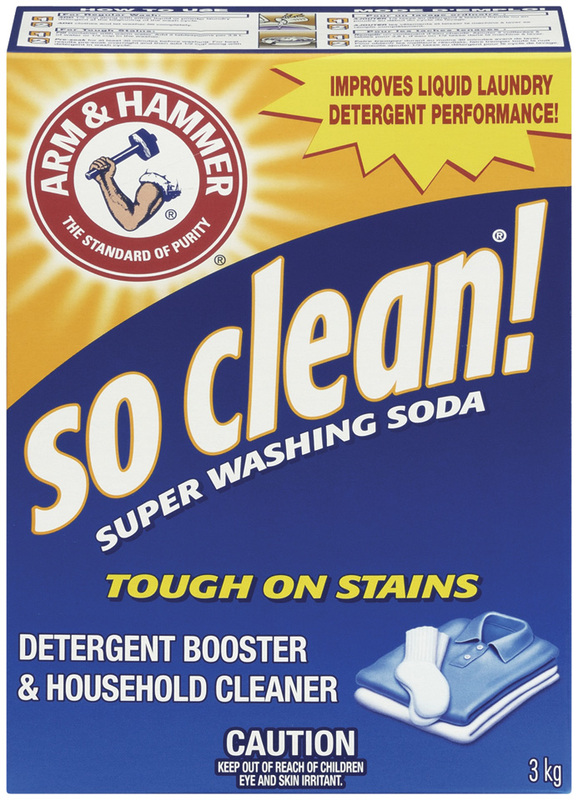 When laundering, add ½ cup of Super Washing Soda in addition to your usual detergent. Always test a small, hidden area of fabric to determine colourfastness before pre-treating. Pre-soak laundry in warm water (use cool water for non-colourfast items as well as for blood and egg stains). Use ½ cup if pre-soaking in a filled washing machine. Pre-soak for at least 30 minutes before washing. Wash with ½ cup of Super Washing Soda in the wash cycle, in addition to your usual detergent. Super Washing Soda is the complete bathroom cleaner that leaves surfaces clean and fresh smelling. As a natural water softener, Super Washing Soda helps to dissolve hard water soap scum where you need it. To clean large areas, dissolve ½ cup Super Washing Soda in a bucket of warm water. Scrub area thoroughly and rinse well. Do not use on fiberglass sinks, tubs or tile. Super Washing Soda can dissolve grease and dirt throughout the kitchen. Ease these messy jobs with a solution of ½ cup Super Washing Soda dissolved in a bucket of warm water. For stubborn, crusted soils, sprinkle Super Washing Soda dry on a damp sponge to scour quickly and easily. Remove burners and soak in solution for at least 30 minutes to banish greasy build-up. Rinse well and dry. A weekly wash with a solution of ½ cup Super Washing Soda dissolved in a bucket of warm water keeps range hoods and exhaust fans grease-free. Rinse well afterwards. To remove greasy, burned-on stains from cookware, try the method that works best for you. Sprinkle dry Super Washing Soda on a damp sponge to scour stains. Rinse well. Or apply a paste of 2 parts Super Washing Soda, 1 part water to stained areas. Let stand for 30 minutes; then wash and rinse as usual. Clean and freshen garbage cans, tablecloths, shower curtains and small appliance covers with a solution of ½ cup Super Washing Soda dissolved in a bucket of warm water. Wash surface and rinse. A weekly wipe down with a solution of ½ cup Super Washing Soda dissolved in a bucket of warm water will keep your small appliances shining and free of dirt and grease. Rinse well. Do not use on aluminum appliances. When taking your furniture in or out of storage, clean wrought-iron furniture and plastic cushions with a solution of ½ cup Super Washing Soda dissolved in a bucket of warm water. For wrought iron, scrub with a stiff-bristled brush, hose off and dry in the sun. For plastic cushions, wipe down with a cloth or a sponge. Rinse well. Outdoor furniture should not be cleaned on wooden decks as Super Washing Soda can remove the finish. Do not use on aluminum outdoor furniture. For easy maintenance of saws, hedge trimmers and clippers, scrub with Super Washing Soda on a moist, stiff-bristled brush. Hose off and let dry in the sun. Do not use on aluminum tools. To remove hardened accumulations of grease, scrub with Super Washing Soda sprinkled on a moist, stiff-bristled brush. Or soak items in a solution of ½ cup Super Washing Soda dissolved in a gallon of warm water. Rinse and dry. Do not use on aluminum surfaces. Dip a cloth in a solution of ½ cup Super Washing Soda dissolved in a gallon of warm water and wipe blinds. Or fill your bathtub with warm water and add ½ cup Super Washing Soda. Soak for 15 to 30 minutes. Rinse and dry. Super Washing Soda can be used with special cleaning plates such as QWICKSILVER®, SilverLion and Speedy Plate to remove tarnish from silver, silver plate, jewelry, gold, copper, bronze, stainless steel and most brass. Super Washing Soda cuts through oil and grease spills. Pour Super Washing Soda generously on spills and sprinkle lightly with water until a paste forms. Let stand overnight. The following day, scrub with a damp brush, hose down, and wipe surface clean.